Home > Hart > Family Law > What is The Family of Law? About What is The Family of Law? This book argues that the legal understanding of 'family' in the UK continues to be underpinned by the idealised image of the 'nuclear family', premised upon the traditional, gendered roles of 'father as breadwinner' and 'mother as homemaker'. This examination of the law's model of the 'family' has been prompted by the substantial reforms that have taken place in family law in recent decades, and the significant evolution in social attitudes and familial practices that has occurred in parallel. 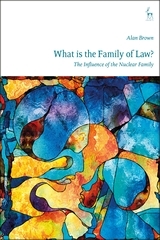 Throughout the book, the influence of the nuclear family is noted in several different contexts: various specific legal definitions of 'family', the legal regulation of adult, conjugal relationships, the attribution of legal parenthood and the construction of the role of the 'parent' within the law. Ultimately, this book argues that while these reforms have resulted in additional categories of relationship coming to be situated within the nuclear family model, there has not, as yet, been any fundamental alteration of the underpinning concept of the nuclear family itself. This book concludes by considering the possibilities offered beyond the 'nuclear family'; exploring the reconceptualising of the legal understanding of 'family' around alternative and potentially 'radical' models of 'family'. 1. What is the Law's 'Family'? I. What is Marriage in UK Law? I. What is the 'Parent' in the Law?